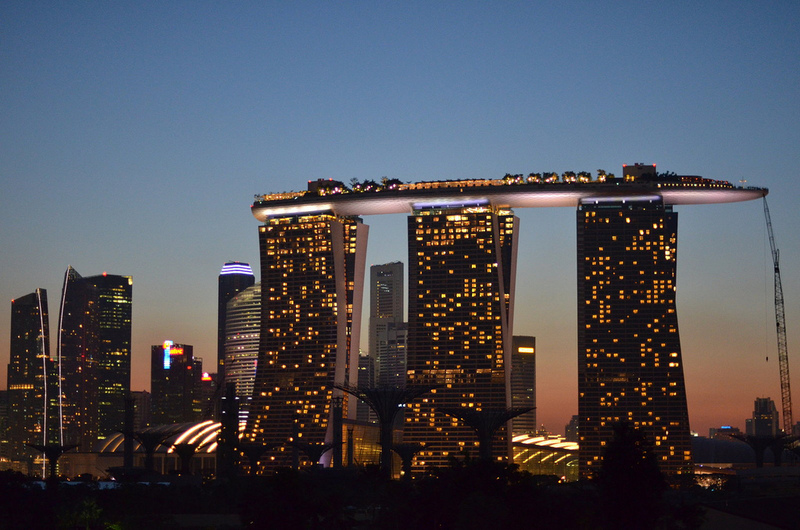 Singapore is well-known to be an expensive city, and can chew through your budget within a few days. Many tourists stick to the beaten path and only visit the same few overpriced attractions. However, Singapore’s real charm requires little to no money to uncover – so mingle with the locals and find out how to stretch your dollar! Singapore is a hotspot for foodies, and for good reason. This island country is liberally sprinkled with eateries, featuring a dizzying array of cuisine. Blend in with the locals and take a seat in one of Singapore ubiquitous coffee shops, where you can order a meal and drink for under SGD5.00. Don’t be deterred by their ramshackle appearances – it is part of their charm and the food is perfectly safe to eat. Take your pick among the multi-cultural choices and stuff yourself silly! Click here for recommendations on local food. With palm trees waving gently in the breeze, the pristine beach of East Coast Park is a favourite with Singaporeans both young and old. Laze around under the tropical sun, or rent a cheap bike to explore along the coast. If you have a little more money to spend, splurge on any of the numerous water sports available. In the evening, cool off at the nearby eateries, or have a barbecue party! Singapore’s famous shopping strip, Orchard Road, is a glitzy affair which attracts tourists from all over the world. It is many Singaporean’s favourite hangout, and you will find the boulevard heaving with activity on the weekends. With more than 20 shopping centres lining the 2.2 kilometre-long road, you can literally shop till you drop. But to save money, you need to know where the hidden gems are! Fast East Plaza: Popular with young people, you can often find students browsing the numerous clothing stores, many of which are independent start-ups. Here, you will find kooky accessories and clothing inspired by Korean and Japanese fashions. Lucky Plaza: This is the favourite haunt of Filipino migrant workers, and as such you will be able to find plenty of products from the Philippines. Mixed in with these shops are electronics stores – it is possible to find some great deals, but be careful not to get scammed! Ion Orchard and Ngee Ann City: These two malls house numerous luxury brands, making them perfect for window shopping. However, the real action is in their basements, where hordes of food stores display their mouthwatering wares. Visit the spectacular Marina Barrage, which has turned Singapore’s old harbour into its 15th reservoir. The centre houses restaurants, shops and a free gallery. If you have children, let them loose in the water play area! Afterwards, make your way up to the eco-friendly Green Roof and have your picnic amidst families and kite enthusiasts. Yes, Marina Barrage is a haven for kite flyers, and you can purchase your own kite in a nearby shop if you wish to join in the fun! You don’t need to pay for entrance into the Botanic Gardens, and it is definitely worth a visit on a weekend – you might even get to catch a free concert! The Gardens have splendid exhibits of various tropical flora, and shady pavilions await the weary. Take a stroll into the Rain Forest, where over 313 species of plants co-exist in a complex ecosystem. Interested in medicine? Perhaps the Healing Garden will interest you, with its 400 varieties of medicinal plants. Learn more about exhibits and future events at the Singapore Botanic Gardens website. Bring a camera with you when you visit Gardens by the Bay, one of Singapore’s newest attractions. Marvel at the Supertree Grove, made out of ‘trees’ 25 to 50-metres tall. These mushroom-like structures are covered with living plants, and comes to life at night with psychedelic light displays. Venture into the World of Plants and the Heritage Gardens to learn more about Singapore and its indigenous tropical plants. You have to pay to enter the Flower Dome and Cloud Forest, but entrance fees are surprisingly reasonable. Are you the kind of person who likes following a guide while catching the sights? These walking tours by Singapore Footprints and Indie Singapore will show you around the heart of Singapore, giving you a glimpse into the rich and colourful history of this modern metropolis. These tours are entirely free, but tips are recommended. Slip on your comfortable shoes and prepare to ramble! Would you like to see what Singapore used to look like? For SGD2.50, you can take a bumboat to Pulau Ubin, where you can stroll through Singapore’s last kampong (Malay for ‘village’). A quiet hamlet filled with rustic beauty, the local residents go about their peaceful lives, relying on fishing and farming for subsistence. For the adventurous, rent a mountain bike and go exploring along roads that meander through the thick rainforest. Don’t forget to visit Chek Jawa Wetlands, the home of 7 interdependent ecosystems. Swing by the free programmes held nearly every day, ranging from orchestra performances to film viewings. For more information about upcoming events, visit The Esplanade website. For all its modern efficiency and soaring skyscrapers, Singapore is still a fascinating city which stays true to its humble roots. With free entry to wide variety of attractions, this country aims to benefit its citizens, rather than turning these places into money-spinners. For those on a budget, it is a great way to sightsee and create fond memories, without money worries to cloud your day!